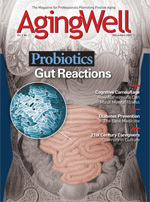 Experts react to the growing use of probiotics by older adults. Could it be the newest boon to elder intestinal health? The number of older Americans is expected to reach 71 million, or roughly 20% of the U.S. population, by 2030 according to The State of Aging and Health in America 2007 report released by the Centers for Disease Control and Prevention and The Merck Company Foundation. And while the third age may represent golden years for some older adults, the fact remains that with aging comes an increased susceptibility to infectious diseases, decreased gastrointestinal function, and increased antibiotic use that can lead to diarrhea and other intestinal ailments. Over the last few years, the benefits of probiotics have been touted by a number of manufacturers. To some, probiotics appear to be the miracle cure for all that ails us. But is that really the case? How do we really know what probiotics are, and how can we know the difference between what works and what’s just fancy labeling? Studies have concluded that probiotics are beneficial, especially to aging adults who often suffer from suppressed immune systems due to the effects of aging and increased antibiotic use. But caution is key as we take a closer look at probiotics and attempt to uncover some of the mystery that surrounds them. According to the International Probiotics Association, Americans are more likely to consume probiotic supplements (capsules) than foods containing these beneficial bacteria. But we’re coming around. In fact, Morley points out that some hospitals and nursing homes are now providing some form of yogurt or Lactobacillus culture to patients taking antibiotics. For many, the first encounter with probiotics occurred with Jamie Lee Curtis advertising Activia yogurt. She outlined how this yogurt has eased some digestive concerns related to irregularity. But my introduction to probiotics was slightly different. My epiphany occurred when my 18-year-old horse began losing weight and appeared out of sorts. Over the years, he’s been on and off an anti-inflammatory medication for an old knee injury and various antibiotics for other unrelated injuries. A veterinary technician suggested a probiotic supplement to help him regain healthy bacteria in his gut. After adding it to his diet, the supplement helped my aging equine. So what are probiotics, and how are they important to aging adults? Many studies suggest that overall health depends largely on the healthy functioning of the digestive system. As Eamonn M. M. Quigley, MD, FRCP, FACP, FACG, FRCPI, a gastroenterologist and the president of the World Gastroenterology Organisation, points out, the digestive system not only pulls nutrients from food to nourish the body but also helps protect the body from disease. And the bacteria that populate the digestive tract play a critical role in both of these functions. The intestine is the body’s most important immune function-related organ; approximately 60% of the body’s immune cells are present in the intestinal mucosa, Quigley wrote in Probiotics: A Foundation for Gastrointestinal Health in Infants, Children, and Adults, coauthored with colleague Jon A. Vanderhoof, MD, professor emeritus of pediatrics at the University of Nebraska Medical Center in Omaha. He notes that the immune system controls immune responses against dietary proteins (prevention of food allergies) and pathogenic microorganisms such as viruses, bacteria, and parasites. The ability of probiotic bacteria to support the immune system could be important to older adults with compromised immune function. Recently, the American Geriatrics Society held a symposium titled “Probiotics: Impact on Health and Quality of Life in Older People.” Leaders in the fields of probiotics and aging shared their insight on the role of healthy bacteria, particularly those in the Lactobacillus and Bifidobacterium genus, including how they prevent potentially bad bacteria from attaching to the gut lining, reduce the availability of nutrients to potentially bad bacteria, help achieve the right acid-base balance for the intestine, support the gut lining and intestinal microflora, and provide ongoing support to the immune system. Simin Nikbin Meydani, DVM, PhD, associate director and senior scientist at the Jean Mayer USDA Human Nutrition Research Center on Aging at Tufts University, whose area of research examines changes occurring in the immune system in response to aging and various nutrients, explained some of the reasons why older adults are more susceptible to infectious diseases. Additionally, she addressed questions about ways the change in gut microflora may contribute to susceptibility to infectious diseases, particularly those contributing to gastrointestinal infections. According to Meydani, limited studies have indicated that structural changes occur of the ecosystem in older adults, causing changes in the bacterial species, according to Meydani. Beneficial bacteria, such as bifidobacteria, decrease while pathogenic bacteria increase. The causes of these changes are unknown, but it’s been suggested that changes in microflora are due to changes in mucin composition (a decline in immune response allowing for more of the harmful bacteria to proliferate), excessive antibiotic use, and dietary changes. Meydani cites several studies in which humans were given probiotics. One study showed that ingesting probiotics for a short period of time caused significant increases in the cytotoxic ability of natural killer cells in both men and women, without much difference between the two types of probiotics. However, after discontinuing the probiotics, levels returned to baseline, indicating that the effect was due to probiotic consumption and that consumption needs to be sustained. Another study of subjects aged 51 to 58 used a dairy drink with a strain of Lactobacillus casei. Again, findings showed a significant increase in the natural killer cells’ cytotoxicity and an increase in the monocyte oxidative burst. Thus, two human studies have shown that parameters of immune response improve with consumption of probiotics. In both studies, there is evidence that probiotics may be helpful for improving the immune response in aging adults. However, Meydani makes it clear that these findings need to be reproduced in larger studies with adequate duration before a recommendation regarding probiotic use in older adults can be made. At the symposium, Morley noted that factors such as stress, antibiotic use, illness, an unbalanced diet, and aging can disrupt the function of the intestinal microbiota and certain bodily functions. But what research has found is that certain very specific probiotics can help strengthen the body’s natural defenses and maintain the digestive system by providing a regular source of friendly bacteria for the intestinal tract. But there’s an important caveat: It’s essential to be sure of what’s ingested. Probiotic research suggests a range of potential health benefits. However, the effects described can be attributed only to the strain or strains tested and not to the species or the whole group of lactic acid bacteria or other probiotics. To understand this, Quigley believes it’s important to first fully comprehend the definition of probiotic. The definition is provided by the Food and Agriculture Organization of the United Nations and endorsed by many probiotic associations. Probiotics are live microorganisms, which, when administered in adequate amounts, confer a health benefit on the host. In other words, to be considered a true probiotic, the organism must be viable and must have been demonstrated to be beneficial in humans. Today, the best demonstrations of clinical efficacy in humans are the randomized, double-blinded, placebo-controlled clinical trials, such as those cited by Meydani. As Quigley points out, it’s a challenge to correctly decipher the difference between what’s true and what is simply fancy labeling. “There are some manufacturers out there who have excellent quality control and clinical data to support their products. But there is also a lot of rubbish. Probiotics aren’t regulated like antibiotics and until they are, this is the dilemma for consumers,” he says. Sanders suggests that professionals direct patients to a published guide that helps consumers make smart choices: The P’s and Q’s of Probiotics: A Consumer Guide for Making Smart Choices. Probiotics are defined by genus, species, and strain designation. The names sound complicated, but they are important for connecting the specific probiotic strain to the strain’s published scientific literature. — Jennifer Mellace is a Maryland-based freelance writer whose articles have been published in various regional and national publications. The concept of probiotics has been around for more than 100 years, but scientists are just beginning to understand their role in maintaining health, regulating the immune system, and managing disease. There are hundreds of probiotic products available along with an overwhelming amount of related information. The following tips can help in selecting a credible probiotic product. • Different strains of even the same species can be different. Probiotics within the same genus do not necessarily provide the same benefits. A probiotic is defined by its genus, species, and strain designation. The names sound complicated, but they are important to connecting the specific probiotic strain to the strain’s published scientific literature. • Product manufacturers create a trademarked or registered trademark name for the strain found in their product. It is just an alias for the probiotic strain and doesn’t necessarily reflect product quality. • Make sure that product claims of health benefits are based on sound research done on the particular probiotic. The product should contain the specific strain(s) of bacteria at the same levels used in published research. The studies should be performed in humans and published in reputable, peer-reviewed journals. Check product Web sites to see study results. • Most probiotics are sold as dietary supplements or ingredients in foods and cannot legally claim to cure, treat, or prevent disease. Claims made on a product, no matter how general, should be truthful and substantiated, but not all manufacturers have this clinical substantiation. • Consult a physician before administering probiotics to older adults with compromised immune systems or other major underlying illnesses. Read warnings on the product package and be aware of any symptoms or side effects. Probiotic foods should be safe for the generally healthy population to consume. • Products you choose should offer resources to find more information, including a Web site or consumer hotline.